Eight years ago Jarrod Harbrow trudged off the MCG with a big secret. It was preliminary final day, Saturday 18 September 2010, and Harbrow was a member of a downcast Western Bulldogs side that had lost the penultimate game of the season for the third year in row. Three times Harbrow had been within touching distance of an AFL grand final only to miss out. Like his Dogs teammates, he was shattered. But hidden beneath the devastation of a hollow defeat three times over was his secret. After four years, 70 games and nine finals with the Dogs. the Cairns-born defender was on the move. He was to be a foundation player with the Gold Coast SUNS. News broke the following day when Harbrow was confirmed as the fifth uncontracted player to sign with the expansion club behind Nathan Bock, Nathan Krakouer, Michael Rischitelli and Campbell Brown. Scott Clayton, SUNS recruiting manager at the time, said recently it was one of his easiest deals. Through his manager Harbrow had let it be known that he was keen to return to Queensland. Clayton wasn’t exactly new to Harbrow. As a former Dogs recruiting manager he had gleefully snapped up the left-footed speedster as a Dogs rookie after he’d left the family home in Cairns and moved to Mooroopna to play with the Murray Bushrangers in the TAC Cup. “He was a gift,” Clayton recalled of the shy and quietly-spoken teenager at the time, who proved to be a bonus-plus rookie pick-up after he had been overlooked by every club in the 2006 AFL National Draft. “He was a beauty. It said a lot about him and what sort of character he was that when it was announced he was leaving there was nothing but good things said. The Bulldogs were disappointed to lose but him they understood he wanted to get back to Queensland, they supported him 100% and wished him well”. It was the beginning an association between Harbrow and the SUNS that has been nothing but good. SUNS insiders tell how Harbrow has given his life to the club on and off-the-field, and were delighted last Saturday night when the club was able to give something back. When he turned up to the annual Club Championship dinner Harbrow knew he was to be the first player to receive life membership. It was announced on the eve of his 150th game in a fitting honour for the club’s games record-holder. He also won the coveted Players’ Player Award, as voted by his peers, plus the SUNS’ Community Award, which is so dear to the heart of a player totally committed to making a difference in the community. And then came the big one which, like his life membership, will also last a life time. He was crowned 2018 SUNS Club Champion. It was the sixth time Harbrow had finished in the top 10 in the SUNS’ B&F. He was 8th in 2011, 5th in 2013, 7th in 2014, runner-up to Tom Lynch in 2016 and 7th in 2017. Only Gary Ablett, with seven top 10 finishes, has had more. 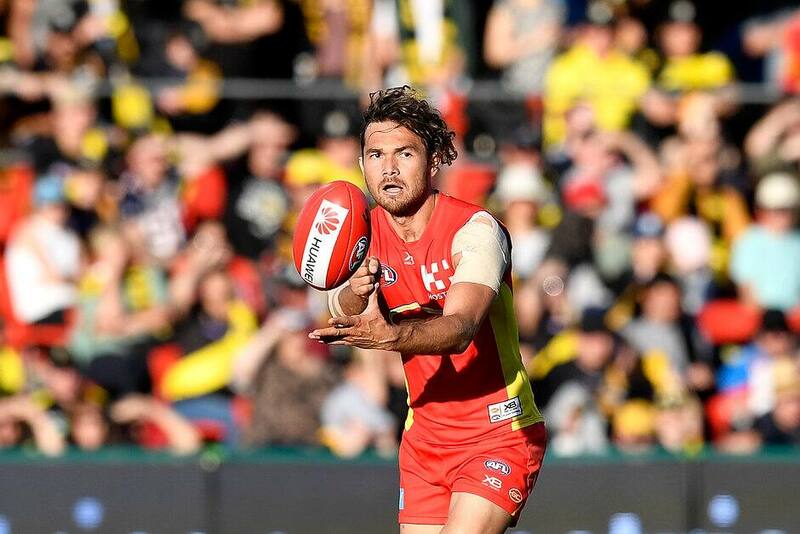 It was all part of a season in which Harbrow worked his way up to equal 10th on the all-time AFL games list among Queenslanders, and 5th among Queenslanders for AFL possessions. Nick Riewoldt (336) heads the games list from Jason Akermanis (325), Marcus Ashcroft (318), Michael Voss (289), Jason Dunstall (269), Gavin Crosisca (246), Mal Michael (238), David Hale (237), Max Hudghton and Harbrow (224). Voss (6143) heads the Queensland possessions list from Akermanis (5868). Ashcroft (5848), Riewoldt (5613) and Harbrow (4352). There was something very special about Harbrow’s club championship win. It was an overwhelmingly popular win for a player admired and respected by teammates and opponents alike, and adored by SUNS fans. Just like the path he walked to the presentation area to receive his array of awards, the vote count became an ongoing tribute to the lightly-built zip-zip man. The top 10 in the B&F finished Harbrow (390), Touk Miller (351), Lachie Weller (336), Rory Thompson (316), Alex Sexton (303), David Swallow (300), Aaron Young (261), Nick Holman (251), Jarrod Witts (251) and Jack Martin (249). As it turned out, Harbrow had enough votes at Round 18 to win.